A few weeks ago, when RIM CEO Thorsten Heins said that size didn't matter, we hoped for his sake that he was referring to BlackBerry World and not making some kind of phallic statement. Potential BlackBerry 10 buyers have been concerned that the revamped app store would not have many of the apps that they are used to using on another platform. Heins said that BlackBerry World would have 200 to 400 of the top apps in each region. If you are accustomed to using the Weather Network on your phone, but you're worried that the app won't be available for BlackBerry 10, better think again. 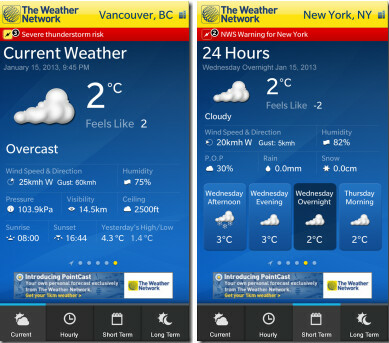 Not only will the Weather Network be offered in BlackBerry World, it also will have a ton of features that will satisfy even the most weather obsessed users. The new Weather Network app for BlackBerry 10 will use the phone's GPS to produce a local forecast for your current location within 1 kilometer of where you are standing. A peek feature lets you quickly switch from watching information about a damaging storm to your local forecast with ease. 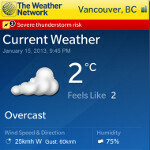 BlackBerry 10 users will be to upload weather related photos directly to The Weather Network. Forecasts include current, short-term, long-term (day and night), 14 day trend (day and night) and hourly forecasts for user’s favorite locations and multiple locations can be tracked. Weather alerts and safety bulletins (think tornado alerts) will be sent straight to BlackBerry 10 handsets and the app can be shared with friends using BBM. A step ahead LMFAO....all I see is last years technology. This may be a step ahead of iOS but this couldn't even hold a candle to Android. I remember reading (awhile back) that BB was teaming with Android on some sorta project. Maybe we'll see a bit of Android in BB10? I'm def diggin the new look, but I'm takin a seat next to the Godfather. Your tears are flooding my screen. Reading a lot of the comments here on Phonearena, I'm reminded of a family gathering during the holidays. The little children get put at their own table away from all the grownups, except in this case, there doesn't seem to be another table, and all the children have been allowed to have "conversations" with the adults and sit at the same table. Anyways, BB10 is very intriguing and I am definitely excited to see what new things RIM brings to the table in a couple of days. I always thought that was just my family lol. I agree it should a great year for consumers. Nothing better than more options and diversity. Only problem is I'm going to want to buy and try them all out. Simply for corporate users it will be a hit. People who are serious about work get a blackberry. That's the exact image they want to shed. They want everyone to want a new BlackBerry.